Originally published on Torontoist on January 24, 2012. When management at Telemedia decided to switch CJCL’s phone-in sports commentary show to a magazine format in the fall of 1989, they looked to Canada’s public broadcaster for inspiration. Prime Time Sports was to be the athletic equivalent of As it Happens, a promise that Star sports media columnist Ken McKee felt placed “a large weight on the shoulders of those involved. As it Happens is only the best show of its kind in the country—and had been for eons” (though Don Cherry might disagree). According to Telemedia’s Allan Davis, call-in sports shows drew too few callers, many of whom made it on air repeatedly. “How many times do you want to hear Montreal Jack from Oakville,” Davis told the Star. 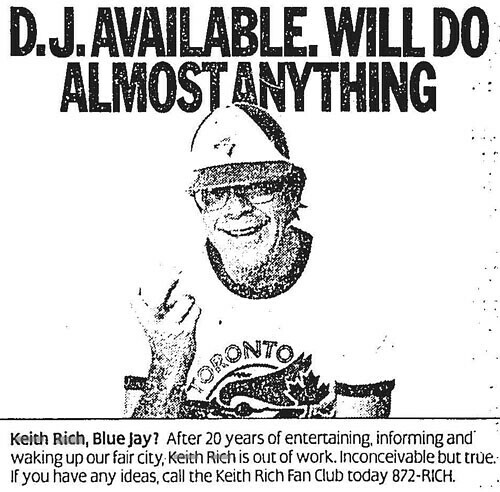 “Maybe Toronto is a city of elitists, I don’t know, but I do know there’s a ‘Don’t bore me’ message in response to talk radio.” CJCL’s call-in show, Talking of Sports, was also plagued by scheduling irregularities due to the length of Blue Jays or Maple Leafs games aired on the station. Host Bob McCown was retained to preside over the phone-outs for Prime Time Sports, which he still hosts nearly a quarter-of-a-century later. Though CJCL had sports in its genes—the station was founded as CKFH by pioneer hockey broadcaster Foster Hewitt in 1951—its non-sports programming during the 1980s and early 1990s fared poorly in the ratings. Attempts to build the rest of the day around talk (initially with former CFRB/future Metro Morning host Andy Barrie as the main draw), adult contemporary, big band, and oldies formats floundered. When the ratings improved after testing a daily seven-hour block of sports programming, CJCL switched to all-sports as The Fan 1430 in September 1992. The station moved to its current home at 590 AM after a frequency swap in early 1995. Additional material from the September 29, 1989 edition of the Toronto Star. 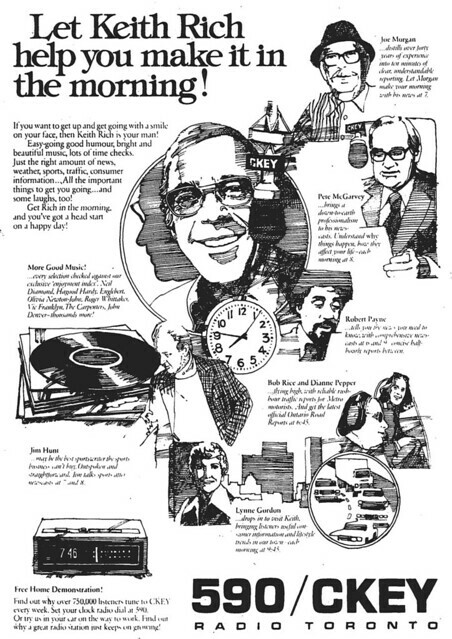 Since 1973, Torontonians have woken up to CBC Radio’s Metro Morning. 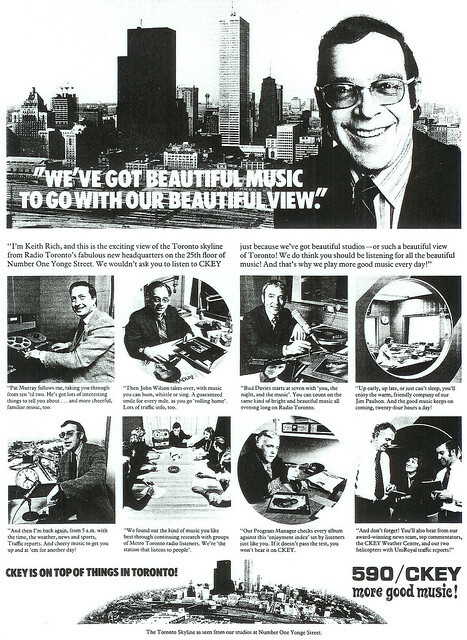 Here’s a sampling of Vintage Toronto Ads posts related to the show and its personalities. Originally published on Torontoist on September 16, 2008. Kudos to the designer of today’s featured ad, which successfully imitates the look and feel of one of the most successful new magazine launches of the 1970s to promote a longtime Toronto wake-up call, CBC Radio’s Metro Morning. 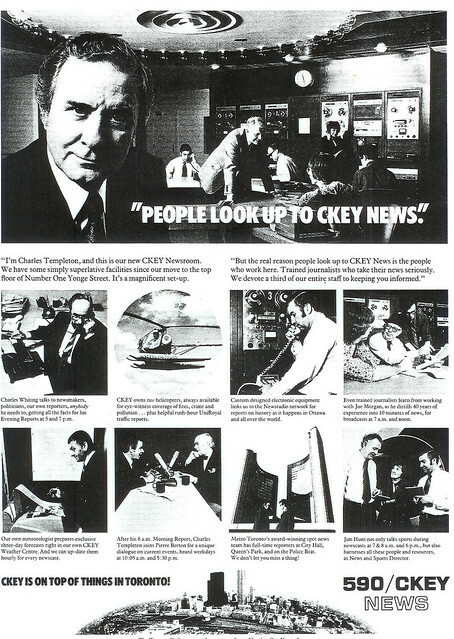 This focus on personalities made the magazine’s cover design appropriate for CBC to borrow in a series of ads highlighting on-air talent throughout 1978. David Schatzky was the third host of Metro Morning since its debut in 1973, following Bruce Rogers and Harry Brown. After his 1976–79 run in the host’s chair, Schatzky continued to work for CBC and later became a psychotherapist. Originally published on Torontoist on February 2, 2010. Toronto Star, October 3, 1988. On yesterday’s edition of Metro Morning, host Andy Barrie announced his retirement from waking up Torontonians for fifteen years. Since arriving in Toronto from Montreal in the late 1970s, his style has drawn praise from listeners of public and private stations for his ability to put a human face on issues and complaints about being in love with the sound of his own voice. Barrie’s tenure at CBC marks the second half of his Toronto radio career—today’s ads look back at his bearded years on-air at private broadcasters. 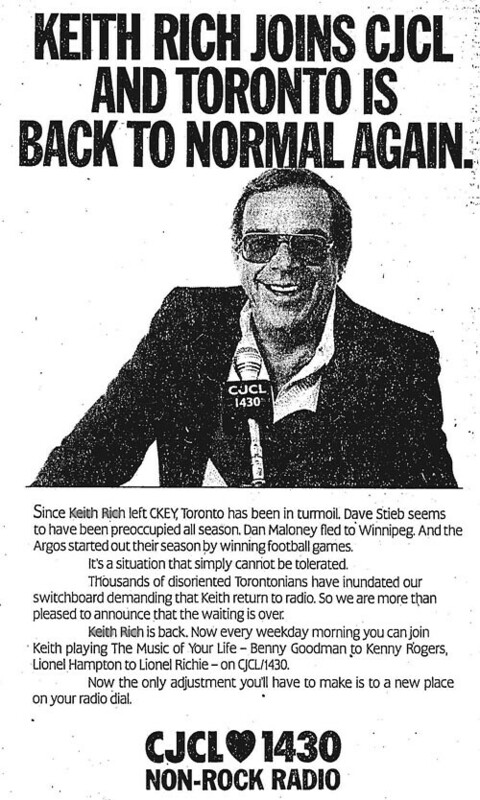 But perhaps there were some discomforts being the “new guy,” as he departed CFRB to become the morning man (and one of the oldest on-air personalities) at CJCL in early 1981. Barrie was part of a station revamp by 1430 AM owners Telemedia, who had just purchased the former CKFH from station founder Foster Hewitt. Barrie faced a challenge at the former country music station, as its previous morning show had drawn barely more than a thousand daily listeners. “When you’ve got no listeners,” Barrie told the Star, “you’re in the same situation as the Japanese when they first tried to crack the North American car market.” He felt the station could start from scratch and focus its efforts on Toronto, as opposed to CFRB’s concentration on Southern Ontario (“Toronto, after all, is where it’s happening now”). CJCL’s mix of news, talk, and adult contemporary music didn’t set the ratings on fire and Barrie wasn’t replaced when he departed the station in 1983. Toronto Star, October 12, 1979. 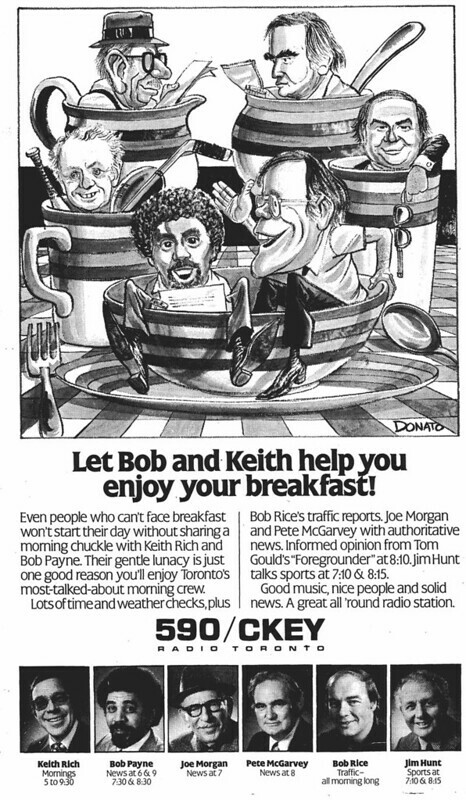 By 1986, Barrie was back at CFRB hosting a late-morning call-in show that took advantage of emerging communications technology. Each morning, the station notified fifteen Ryerson students what the day’s discussion topic would be, then set them loose on the streets of Toronto with “cordless cellular phones similar to walkie-talkies” to solicit responses that were mixed in with regular calls to the studio. Barrie felt this approach allowed people who normally didn’t listen to CFRB to take part in the discussion. Barrie was in the early phases of renegotiating his contract with CFRB in 1995 when CBC offered up Metro Morning. He saw this as an opportunity to solidify his ties to Canada. “My wife just said to me yesterday that joining the CBC is a nice thing to do with my citizenship,” he joked to the Globe and Mail. “I think when you’re an immigrant to this country working at the CBC feels like a second arrival. I think the CBC is an astonishing organization and I’m glad to be part of it.” It was also a fresh opportunity: Barrie compared the possibility of staying at CFRB, where many of its personalities had long runs, to being “like the prom queen never being asked out because everyone thinks she has a date.” Newspaper reports indicated that many CFRB staffers were upset at the departures of Barrie, Jane Hawtin (who went to 640 AM), and Brian Linehan (who left when management wanted to go with a harder-edged approach to entertainment reporting). Station president Gary Slaight was philosophical about the departures, noting Barrie and Hawtin received offers they couldn’t refuse. Reading between the lines of an interview with the Star, one suspects that Slaight wasn’t unhappy that two personalities perceived to have leftish biases were gone as CFRB remade itself into a younger, further-right voice than it had been. Barrie’s first year at Metro Morning was a rocky adjustment for some listeners, as CBC phone lines received complaints that the new host had too musical a voice, pontificated too much, and was generally too exuberant. Barrie took in listener reactions (he was said to be the first host to drop in on focus group sessions), settled in, and led the show’s climb toward the top of the morning ratings. Additional material from the July 25, 1995, and June 29, 1996, editions of the Globe and Mail, and the December 12, 1980, May 16, 1981, August 31, 1986, July 25, 1995, and July 29, 1995, editions of the Toronto Star. Originally published on Torontoist on March 27, 2012. Toronto Star, June 1, 1970. This week marks the end of an era for loyal CBC Radio listeners because, after 40 years of traffic reporting, Jim Curran will provide his last update for Toronto commuters on Friday. Part of the Metro Morning team since the show debuted in April 1973 as Tomorrow is Here (the name changed a year later) and a fixture on the afternoon drive show for just as long, Curran has provided a parade of hosts with the latest on the city’s gridlock. We suspect that his soothing, easygoing style has likely prevented a road rage incident or two. Online reaction to his retirement announcement last month was so widespread that Curran became a trending topic on Twitter. Before he joined CBC in 1972, Curran studied radio and TV journalism at Ryerson. During his undergrad career, he was part of CFRB’s “Good News” program for budding journalists, which we covered in a previous column. His fellow upbeat reporters included longtime instructors at Centennial College and Concordia University, and a future serial investor. Additional information from the April 2, 1974 edition of the Globe and Mail.